If you are fed-up with the rot that is consuming most organizations and you want to find a truly inspirational way of developing yourself (or those within your organization) In Search of Leaders will help you escape. If you freeze water it becomes ice. Yet, when melting it reverts to water. This is change. If you burn a stick of wood, it becomes ashes. It can never become wood again. This is transformation. Learn how to transform yourself, rather than simply change. 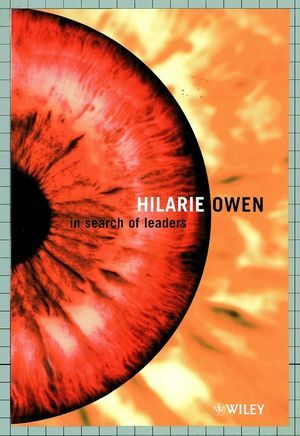 Follow the journey on which Hilarie Owen takes you, a journey that will allow you to discover your potential as a great leader in your own sphere of ambition and beyond. 'Illustrates brilliantly the importance of understanding the human essence of leadership.' Warren Bennis, Distinguished Professor of Business Administration, University of Southern California and Visiting Professor of Leadership, University of Exeter. Author of On Becoming a Leader and Organizing Genius. Hilarie Owen's career began in the field of marketing with IBM and another blue chip company. She spent a year with the Government's Department of Trade and Industry launching The Enterprise Initiative. Broadening her career to Management Consultancy she eventually took the plunge to set up her own consultancy at the beginning of 1991 working with organizations in the private and public sectors. Following the success of her book Creating Top Flight Teams, she has worked world wide developing first class teams. Hilarie has spoken at conferences around the world, lectured at Cranfield Business School and advised the Department of Education and Employment. The Institute of Leadership is an initiative set up by Hilarie Owen and a small team of experienced individuals. It is a non-profit-making global network to research and develop the whole concept of leadership everywhere. The Seven Essences of Leadership.